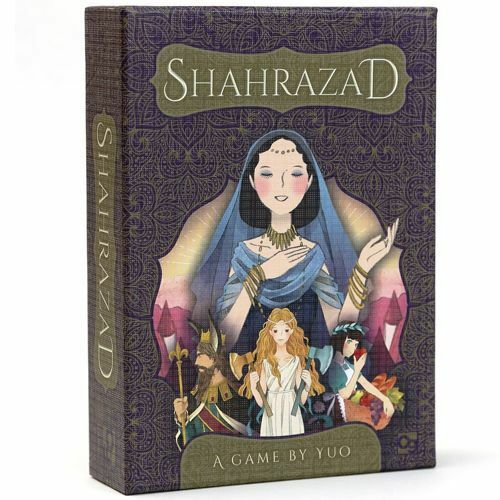 Shahrazad (an alternative spelling of Scheherazade) is a small box, cooperative tile-laying game for one or two players designed by Yu Ogasawara and published by Osprey Games. 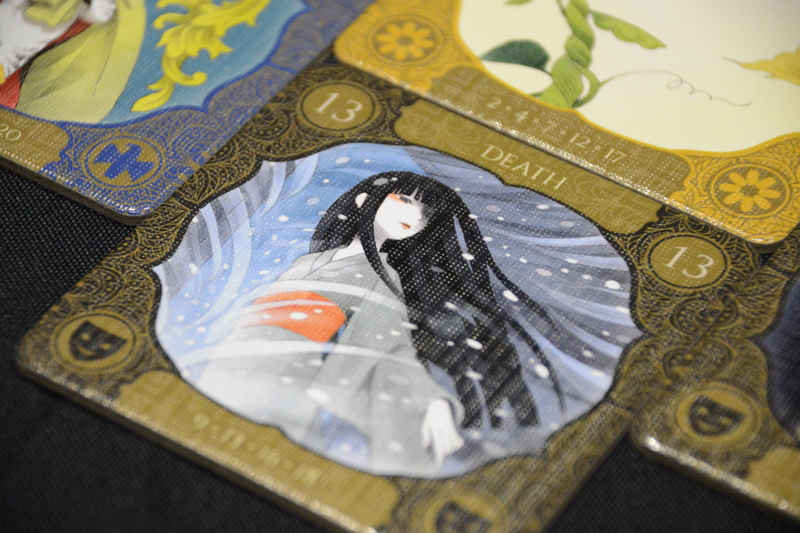 The game features beautiful, lush art on 22 tiles by illustrator Kotori Neiko who also did the art on the small box game Birdie Fight! Each tile is numbered 0 to 21 and each belongs to one of four suits or colors. The solo (and 2 player) game is played over two rounds. The goal is to score as many points as possible by arranging tiles in columns across the table in a checker board fashion with no more than four tiles in a column. To start, a random tile is placed in the center of the gaming area and the player takes two tiles from the shuffled, face-down stack. The player will place a tile every turn adjacent to a previously placed tile and then draw one tile back up to two. The player may choose instead to replace an existing tile with another from her hand. In this case, she would then place two tiles on her next turn. You cannot replace tiles in two consecutive turns. Once all the tiles are placed, tiles are scored but first some may be eliminated from scoring. First, tiles touching must increase in value from left to right. If one does not, it is flipped over and does not become part of the scoring. Second, tiles must form a valid path from the left side of the field all the way to the right side, in increasing value. If any do not, they are flipped over. Then, you identify the largest group of each connected color and score a point for each of those tiles and subtract one point for each empty space where you may not have paced a tile in a column. You then leave one column behind, shuffle the remaining tiles together and begin round two. This followed by another scoring phase which is added to the previous score for your final tally. Mechanically there is nothing wrong with the game. Shahrazad is a light, puzzly sort of tile layer; a solid filler perfect for couples and a nice little distraction for the soloist. Although you do have some choices in placing tiles, it is somewhat random in so far as tile draws are concerned and only slightly mitigated by the choice of placing one or two tiles, or replacing one all together to assist in your strategy. There is no theme here as it’s more of placing increasing numbered tiles and trying to get large groups of like colors. Exquisite art and component quality. 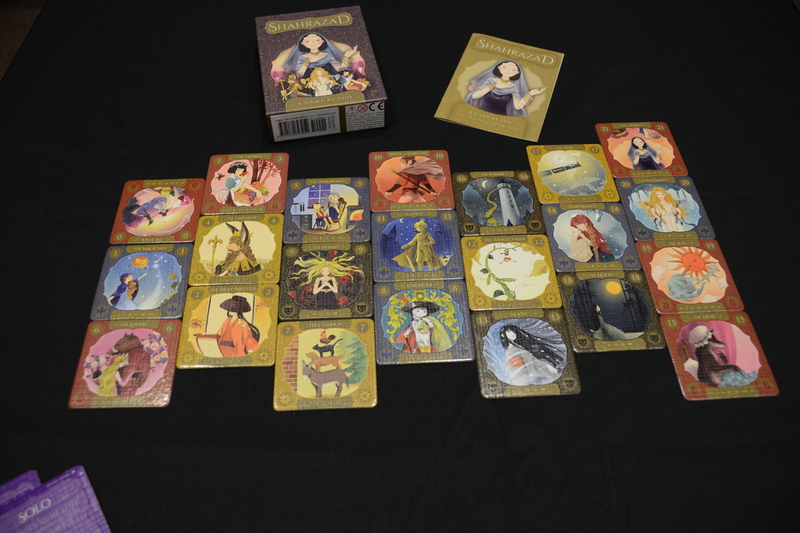 When I first opened the box, I was hoping the art would feature characters and places from 1001 Nights as told by Scheherazade and that the style of artwork be more indicative of Persian culture even if only a westernized version. 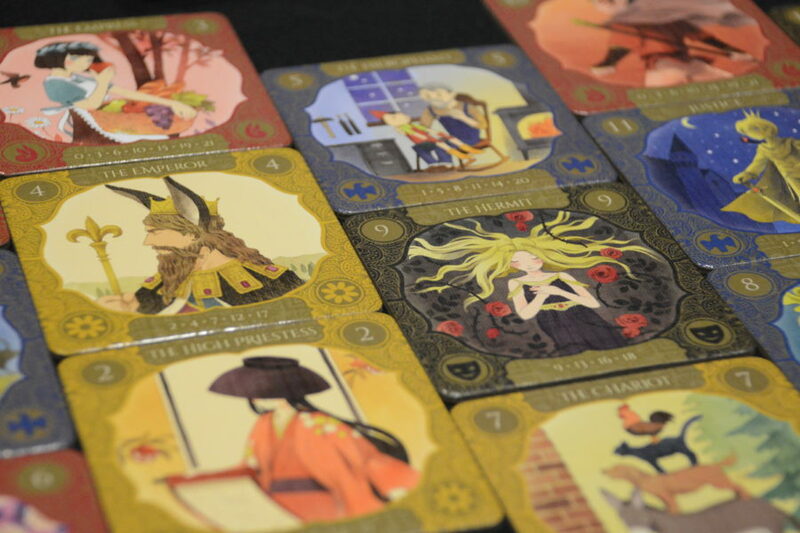 Instead, it features the names and art suggestive of the 22 tarot cards of the Major Arcana. Plus, most of the illustrations feature famous folklore and fairy tale characters like Puss in Boots, Red Riding Hood’s Wolf, and Gepetto and Pinnochio. I get the “story telling” idea but it’s sort of mish mash. As nice as the art is, I was a little disappointed with the disconnect of the art from the title and what I was expecting. 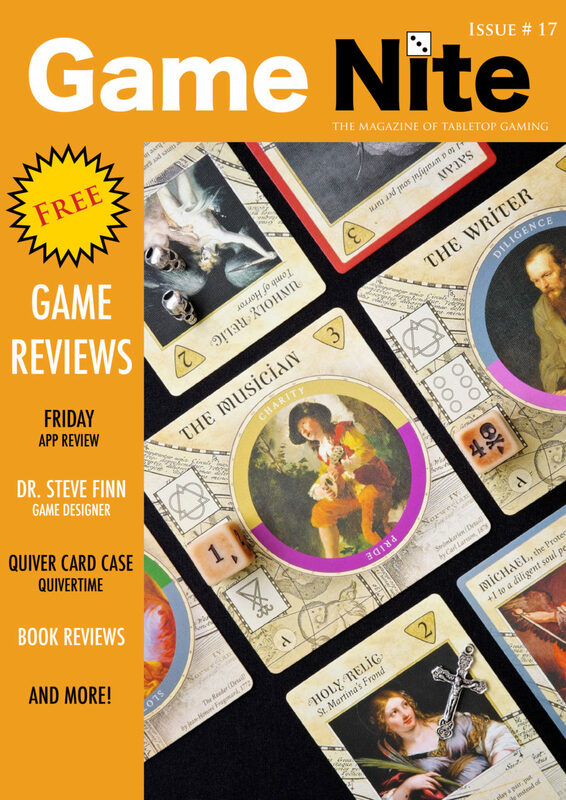 Osprey seems to be on a roll with its small box games like Odin’s Ravens, the Raven’s of Thri Sahashri, and the Lost Expedition. The component quality is outstanding. The included scoring tiles where one overlaps another to keep score is gimmicky and unnecessary. In fact it’s just easier to use pen and paper. I can’t imagine anyone pulling this game out often for solo play trying to beat their own score, but all things considered, it is still a solid addition to a gamer’s library especially as it fills a dual purpose as a light co-op, couples game, filler niche.